Practice Guitar Every Day? Yes. And no. A player asked me yesterday if he could postpone his lesson a week because he didn’t get to play much that week. Of course, that’s fine with me, but I thought I’d share a little of what I’ve learned regarding this, both as a student and a teacher. Consistent practice is very important but we do have times when we just can’t practice consistently. If we feel that we can’t move ahead until we make up for that lost time, we may be right, but we also may just be being hard on ourselves. This could lead to feeling a little guilty when we can’t get to the guitar and if that builds up, we may feel so bad about it that we quit playing. That’s the mistake, not missing some playing time. One of the more powerful aspects of steady lessons is that they keep you on the path to your goals, even when you’ve had a crazy week(s) with no time to practice. 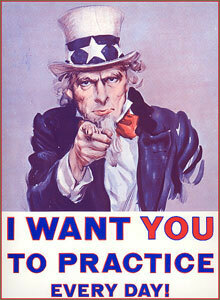 If it gets to where you’re not able to practice for 6 weeks, then that may be time to reevaluate. Regular practice is important but sometimes we just can't. If we feel that we can't move ahead until we make up that time we may be being hard on ourselves. « Why Practice Guitar Slow? Fun Lessons for Kids, Too! How to Play To a Metronome? Do it Wrong! Don’t Like Repetitive Guitar Practice? Why Use a Guitar Strap? Should I Practice Guitar on Vacation? How Do I Help My Kid Play Guitar?